At the start of the 15th Century, North East Europe was dominated by the expanding territories of the Order of Teutonic Knights. They had forged a state out of the lands of the pagan Prussian tribes and were expanding into Lithuania. The Polish and Lithuanian states were united by the marriage of Jadwiga of Poland and the Grand Duke of Lithuania who took the name Ladislaus Jagiello. He converted to Christianity before his election as King of Poland in 1396. This unification created a powerful bulwark against the Teutonic Knights. They decided to launch an offensive against the Order when the current Treaty ran out in 1410. The objective was an invasion of Prussia and the capture of the Order’s headquarters at Marienburg. On 9 July 1410, the Union army crossed the borders and moved towards the Dwerca river. The Teutonic Order was drawn up on the opposite side of the river in a strong defensive position. 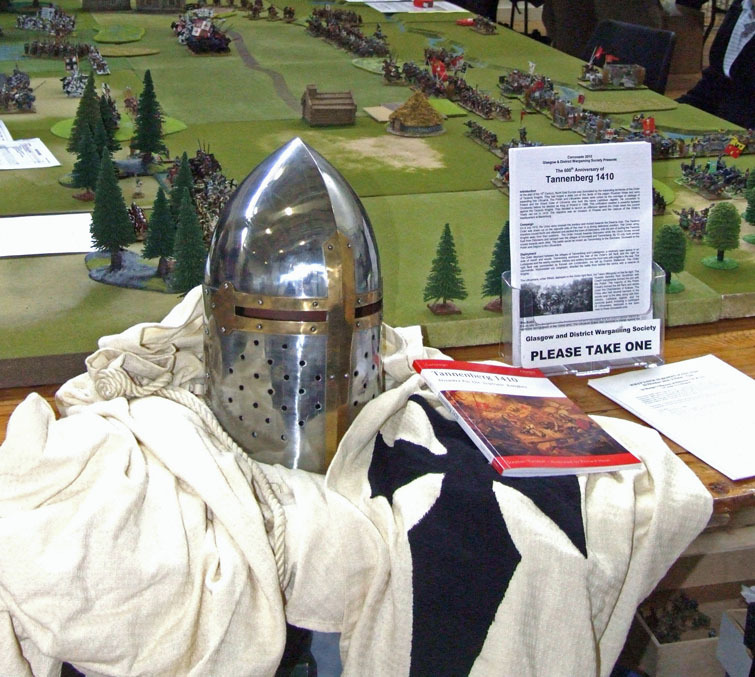 The Union army, therefore moved North and attacked and sacked the town of Dabrowno, with the aim of pulling the Teutonic Knights away from their positions. The Order moved towards Dabrowno while the Union forces moved East from Dabrowno and camped near the villages of Grunwald and Tannenberg. By 15 July, both armies moved towards each other. The battle would be known as Tannenberg to the Germans, Grunwald to the Polish and Zalgiris to the Lithuanians. The Order deployed between the villages of Tannenberg and Lodwigowo, a relatively open space in an area of marsh and woods. Tannenberg anchored the rear of the Order's left flank and the right by Lodwigowo and the nearby marshes. 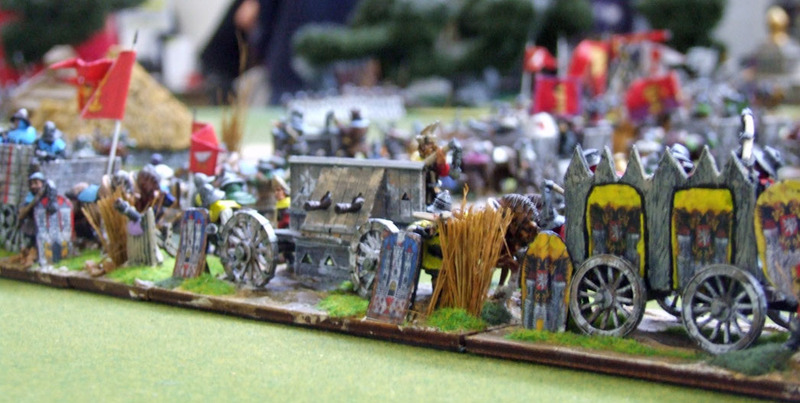 Infantry and artillery formed the front rank with knights in the rear. The right flank was commanded by Konrad von Lichtenstein, the left by Fridrich Wallenrod. The Order commander, Hochmeister von Jungingen, directed the battle from behind the centre with a reserve of Knights. The Lithuanians, under Witold, deployed on the Union right flank, the Tatars (Mongols) on the far right. The Russian banners from Smolensk with Czech mercenaries formed the join with the Polish. The majority of the Polish Cavalry formed the left flank and centre under the Chamberlain of Krakow. The Poles also had several banners in the woods near to the lake, along with their infantry. Ladislaus Jagiello and his personal guard, including a contingent of Lithuanians, deployed in the open near to these concealed units. Shortly after 9am, the light horse of both sides skirmished in the middle and the Order’s cannon started an ineffective bombardment of the Union army. The Lithuanian forces then launched a charge against the infantry and cannons to their front, overrunning both. Von Wallenrod Knights were committed to stem the rout. The Tatar light horse either broke and ran, or faked a rout drawing Crusader Knights away from the main battle and towards the Tatar camp. Von Wallenrod's command engaged the main line of the Lithuanians and was slowly pushing them back. Witold, therefore, committed his reserves, stabilising the right wing. Von Jungingen ordered a general advance against the Polish line but neither side were able to make headway and the fight became a slogging match. Von Wallenrod then committed part of his second line to the fight with the Lithuanians and the added pressure started to force the Lithuanians even further backwards. Witold and his Lithuanians then either broke in rout, or feigned a rout backwards towards the woods near the Lake and the Order banners pursued them in their flight. Von Wallenrod and the remaining banners of the second line, instead of joining the pursuit, deployed for an attack on the right wing of the Polish force. However, three Russian banners and several Lithuanian ones managed a fighting withdrawal which stabilised the right wing, allowing the Chamberlain of Krakow time to re-deploy part of his support lines. As Chamberlain of Krakow attempted to prevent the encirclement, he and his standard bearer were wounded and the standard captured by the Teutonic knights. The Order knights thought the Polish king had been killed and surged forward, believing the battle won, but Polish reserve banners of the second line counter charged and successfully rescued the Chamberlain, Marcin and recaptured the standard. Those Banners pursuing the Lithuanians began to rejoin the main battle line and the Polish line came under increasing pressure. King Jagiello released the last of the reserves and the battle lines once again stabilised. The Crusader Banners pursuing the Lithuanians reached the edges of the woods when they were hit in the flanks by the hidden Polish Knights and counter charged by the now rallying Lithuanian cavalry who wiped them out. Both sides re-ordered their ranks for the climax of the battle. 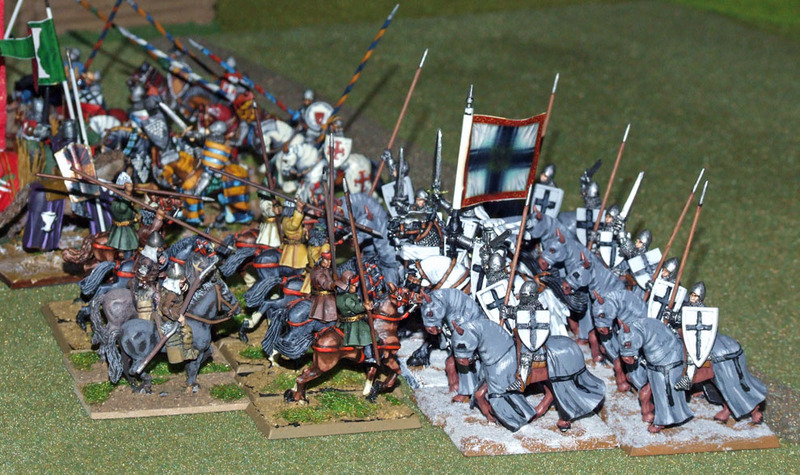 Witold used the lull to rally his dispersed Lithuanians and moved them around to the Teutonic Knights’ rear. Jagiello launched the Polish infantry into the tightly packed knights causing numerous casualties. At this stage, Von Jungingen realised the precarious of his situation and ordered a fighting withdrawal as Witold and his Lithuanians launched their attacks on the Teutonic Knights’ rear. 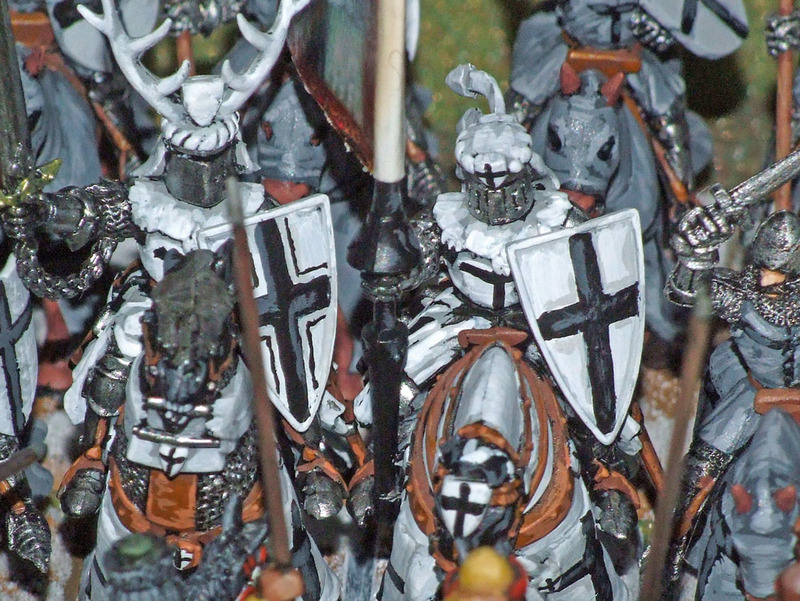 Almost simultaneously, the Polish centre broke through the Teutonic Knights’ line and the Order found themselves surrounded within two groups. The fight degenerated into a slaughter with all resistance collapsing on the death of the Hochmeister Von Jungingen. The Order records that they 18,000 men were killed and the Poles make an unlikely claim that a further 14,000 were captured. Polish and Lithuanians are estimated to have 5,000 men killed and a further 8,000 wounded. The numbers on both sides are far from certain. It is generally assumed that the Order had 27,000 troops. 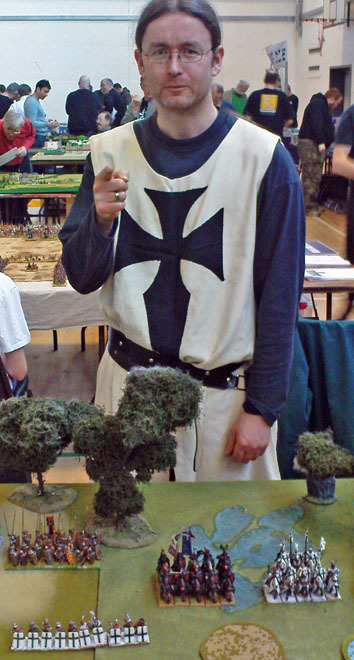 There was a small core of Teutonic Knights supplemented by Prussian feudal and crusader knights, mostly from Germany. Infantry consisted of Order foot, with spear or axe, and crossbowmen including Genoese mercenaries. The Union army was much larger totalling around 39,000. The Polish army was based on feudal knights, with lighter armed retainers (around 18,000), and a smaller infantry force of around 4,000. They also had Czech mercenaries including Jan Zizka, the future Hussite leader. The Lithuanians had around 15,000 cavalry, with 3,000 Tartars and some allied Russians. The foot were probably Samogitians whose rebellion against the Order had preceded this campaign. 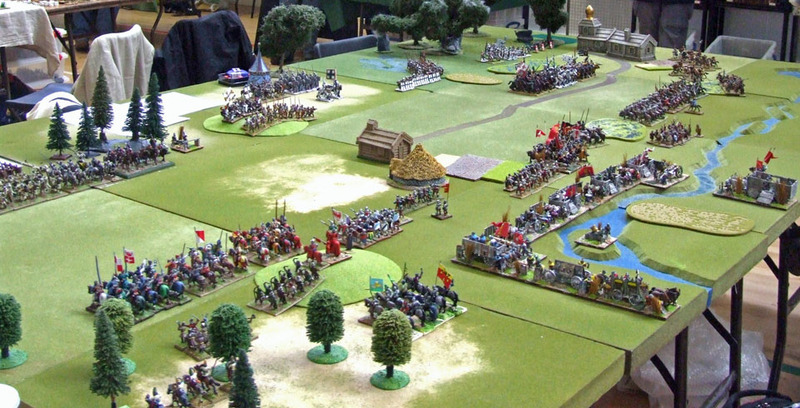 The game is played using Warhammer Ancient Battle (WAB) rules with 28mm figures from a variety of ranges and collections within GDWS. For further information, the Osprey Campaign 122 Tannenberg 1410 by Stephen Turnbull provides all you need. Matthew Haywood’s Warfare in Eastern Europe web site is a good online resource.